Ho Chi Minh City which is also known as Sai Gon offers an impressive array of food for its visitors. A Ho Chi Minh food tour through the bustling city enables you to discover more Vietnamese food than just Pho or Banh Mi. The complexity of flavors together with the fresh and simple ingredients will absolutely satisfy all the foreign tourists. No matter what time of day, the visitors can look people eating and preparing food and smell alls kinds of wondrous things, which can be difficult for travelers to choose one. A popular meal in Vietnam in general and Ho Chi Minh city, in particular, has rice or noodles, a meat or seafood dish, a dish of vegetable, soup and fermented fish sauce (nước chấm). Most of the food in Ho Chi Minh City can be enjoyed at any time of the day. However, following are some famous food and helpful guide that tourists should make use of when going on a Ho Chi Minh food tour. 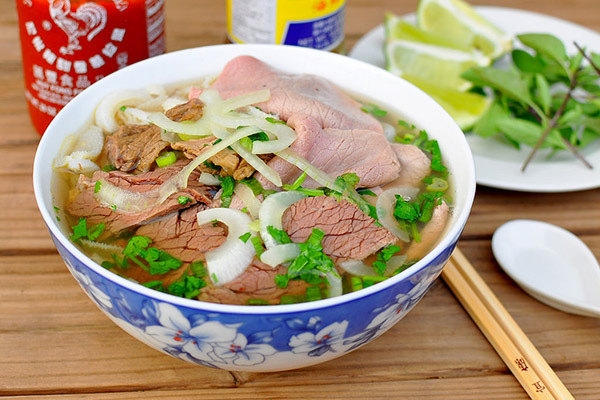 Pho is definitely a signature dish of Vietnam. A basic bowl of Pho has beef slices, beef meatballs or beef flank, covered with bean sprouts, lime wedges and fresh herbs as mint, onions, cilantro…People often eat Pho for breakfast, the price ranges from VND 30,000 to VND 50,000, it can be lower in the local restaurant or street marker. The visitors can go to Ho Chi Minh District 4 to have a variety of food options with lower prices in comparison with District 1. Pho is available all day long there in the smaller or family-run food establishments. 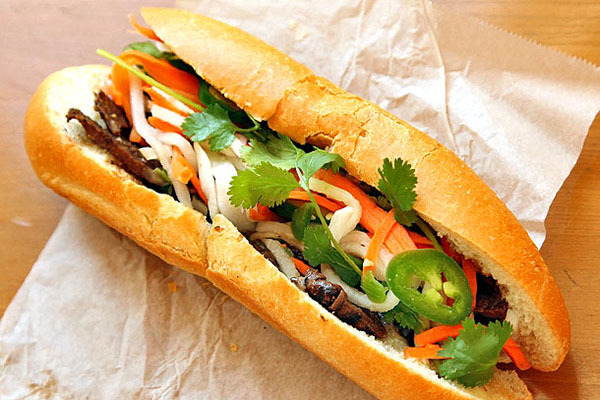 Banh mi is one of the most popular food in Vietnam introduced by French. The special points of Banh Mi is the meat inside the bread. The meat can be some kinds of steamed or roasted pork belly, grilled chicken, Vietnamese sausage as well as some other pork. Other usual condiments are pate, cucumber, carrots, coriander or daikon. People can enjoy Banh Mi with some condiments as chilli sauce, mayonnaise or cheese. Visitors can catch up with Banh mi stalls on almost streets of Ho Chi Minh City with no difficulty. The buyers can choose their favorite ingredients by pointing, the local people can see it as a signal about what the buyers want. Having some similarity with crepe or pancake, Banh Xeo is made of coconut milk, turmeric and rice flour and filled by chicken, pork, vermicelli noodles, sliced onions, bean sprouts, mushrooms and shrimps. The price of Banh Xeo is not too high, usually VND 15,000-20,000 (around $1). The visitors firstly should see how the local people wrapping Banh Xeo, they often wrap Banh Xeo in mustard leaf, lettuce leaves with “nem lui” (lemongrass pork skewers) and some kinds of herbs as mint leaves and basil, and then dipping it in fermented peanut sauce. 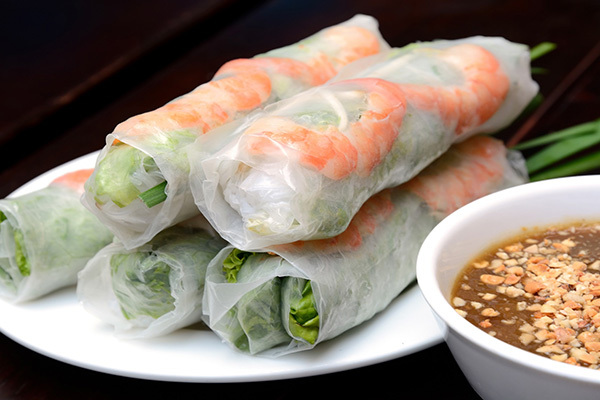 Goi Cuon or Vietnamese fresh spring rolls is another dish that attracts many visitors because of it frugality. The rolls contain with thin vermicelli noodles, pork slices, basil, lettuce, basil, all the ingredients will be wrapped in translucent rice paper, which is called Banh Trang in Vietnamese. Because of subtle flavour, Goi Cuon is often served with ground chillies and sauce topped with crushed peanuts. Goi Cuon in Ho Chi Minh is often prepared in the front with a seafood and pork option, which can be easier for foreigners to choose. Despite originating from Da Nang, Mi Quang can be seen at any restaurants in Ho Chi Minh City. Mi Quang is the mix of bone broth seasoned with black pepper, fish sauce, shallot, garlic and variety of ingredients as river shrimp, boiled quails eggs, roast pork. Same as other dishes in Vietnam, Mi Quang is also served with many kinds of herbs as basil, coriander, lettuce, sliced banana flowers, peanuts and sesame rice crackers. The travelers can easily recognize Mi Quang due to its yellow coloured rice noodles. 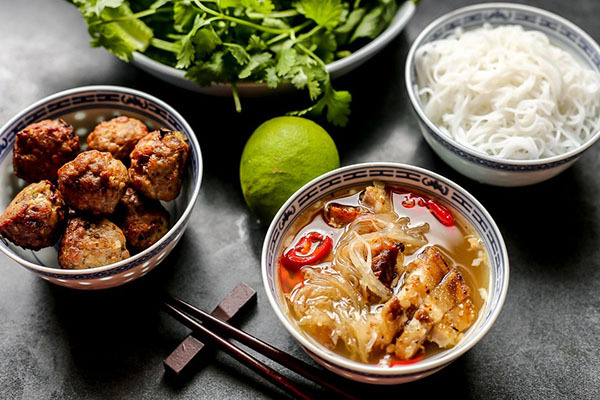 Bun Cha is one of the most tasty and popular dishes in Vietnam as well as Ho Chi Minh city. A Ho Chi Minh food tour should not miss this dish. There are many ingredients contributing to this delicious dish, they are vermicelli rice noodles, chopped lettuce, sliced cucumber bean sprouts, pickled daikon, basil, chopped peanuts, mint leaves, grilled pork shoulder. Bun Cha is different from other noodle dishes that it does not come in a soup or broth but come with “nuoc cham” to create flavourful ensemble. The literal meaning of Com Tam is the broken rice. This kind of rice is traditionally eaten with fried egg, diced green onions and many other meats. Com Tam can be enjoyed at any time of day, but breakfast or lunch will be the best choice. In the street markets and roadside food stalls, the price of Com Tam is VND 20,000 per bowl (about $1). The visitors can have a variety of choice for toppings as barbecued pork chop – Suon Nuong, shredded pork skin – Bi, steamed pork and egg patty – Cha Trung. In addition, Com Tam is also served with vegetables, cucumber slices and “nuoc cham” – Vietnamese dipping sauce. 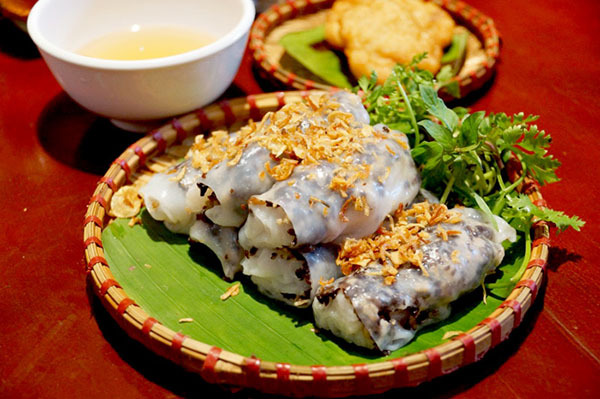 Banh Cuon which is well-known as rolled cake will absolutely bring the great eating moment with peckish whilst going on a Ho Chi Minh food tour. The ingredients making the special of this dish are ground meat – chicken, shrimp, port; minced wood ear mushroom, onions, Cha Lua ( Vietnamese ham), steamed bean sprouts and cucumber. All of them will be wrapped in a steamed rice flour sheet, which creates the amazing mild taste in spite of savoury ingredients. Visitors can have it with dipping sauce (nuoc cham) to have more flavour. Banh Cuon is available on almost roadside vendors so it is not worth worrying about where to eat, especially in Ho Chi Minh City, where the nightlife is bustling and food is available all the time. Vietnam is the land of coffee, as a result, the visitors should once time sit in some coffee shop and enjoy a cup of coffee. The famous and the largest coffee brand in Vietnam is Trung Nguyen, which has over 1,000 cafes through the country. The coffee in Vietnam or in Ho Chi Minh City is often put in the bottom compartment of the silver filter with filter holes above. The hot water will be pulled together with the coffee and then dripping through the coffees in order that coffee will drip into the cup. After some minutes, when the process is complete, the tourists can ask for condensed milk, sugar or ice to put into the coffee cup. The traditional coffee in Vietnam is absolutely tasty which refreshes people along the hard working day. Tourists can freely choose to enjoy coffee at the luxury coffee shop as Starbuck, Trung Nguyen or Highlands or merely sit on a vendor store with a cup of black coffee. Che should be listed as the top recommendation desert for the Ho Chi Minh food tour. Che is a Vietnamese word which means sweet soups. The ingredients in Che are diverse, shaved ice, ice cream, jelly, tapioca pearls, fruit, coconut, sweet beans, condensed milk…; they will be put together in a bowl or cup. However, there is not English menu of Che, the foreigners have to look at the pictures given by the host to choose. 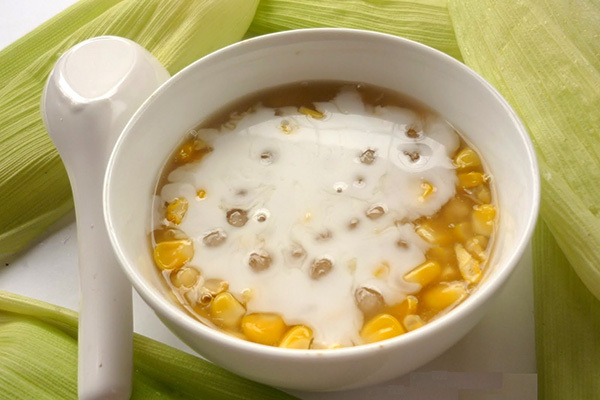 By any way, it is worth, complete worth for trying, this dessert is delicious and especially suitable for such a hot city as Ho Chi Minh City. A Ho Chi Minh food tour is not only interesting but nutritious, savory and hearty also. Rice, noodles, pork, beef with the fresh herbs, spices and flavors are definitely make the Vietnamese cuisine more outstanding and favorable. Above are just 10 out of thousands of delicious dishes that tourists should try when stepping on Ho Chi Minh City. Ho Chi Minh City is the cosmopolitan landscape with the sprawling shopping center, fine-dining restaurants as well as luxury hotels. However, the bustling and wealthy of a city cannot hide the beauty of the local food. Once coming here, tourists should go on a food tour with the traditional dishes to see the true spirits of Sai Gon – a bustling and friendly city.